James Street shoppers may have noticed the recent demolition of the terracotta-roofed Centro building located on the corner of James Street and Doggett Street in New Farm. The building has made way for a new James Street hotel called The Calile which promises to be a new icon for Brisbane. 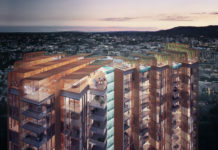 Designed by Richards & Spence Architects, The Calile will reach a height of seven storeys and will comprise 178 luxury hotel rooms and suites together with over 2,600 square meters of new retail and hospitality space. With a key focus on subtropical style, The Calile promises a oasis resort feel in a city-fringe location. 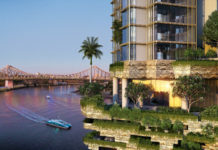 According to the architects the building seeks to embrace Brisbane’s sunshine, blue skies and love of outdoor living to create a hotel that will set a new standard in design and service for travellers and locals alike. A mix of ground floor boutiques, restaurants and cafes will give way to the podium level designed to be a raised urban landscape – complete with pool, cabanas, a poolside restaurant, day spa, fitness centre and business centre. The podium level will also house a function room with capacity to host banquets for up to 300 seated guests. Basement parking will be provided for 220 vehicles. 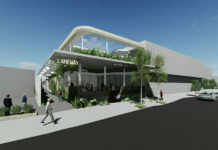 The Calile is being developed by Calile Malouf Investments (CMI) who also delivered the popular James St Market. The new development will take on the name ‘Calile’ which has had significance to the family throughout several generations. The Calile will be operated by Australian based TFE (Toga Far East) Hotels and will become the second hotel in the new TFE Hotels Collection. TFE Hotels operates or owns 70 hotels in Australia, New Zealand, Asia and Europe and has 10 more projects in the design or construction phase, to open in the next two years. TFE Hotels CEO Rachel Argaman is confident that The Calile is set to become Brisbane’s most enduring hotel. “We are really excited to be partnering with CMI, who have been instrumental in transforming James Street into the most sought-after destination in one of Australia’s fastest growing cities,” she said. 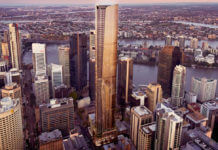 high-quality hotels in Brisbane,” Cr Quirk said. “Hotel guests will also be able to take advantage of the highly-popular James Street precinct on its doorstop, with its vibrant dining, retail and lifestyle opportunities.” Lord Mayor Graham Quirk. Located 2.5kms from the CBD and 14kms from Brisbane airport, James Street has established itself as Brisbane’s foremost retail and lifestyle precinct. Having emerged organically from its inner-city industrial roots, the street and surrounding area have evolved into a high energy urban hub. James Street has a mix of lifestyle retail and hospitality including cinemas and over 130 specialty shops, from designer clothing and homewares stores to award-winning restaurants and cafes, art galleries and design havens. Chester’s Real Estate’s Greer Gittoes says the hotel development will deliver much-needed retail space to a precinct at capacity due to very high demand. development and the broader precinct,” she says. Excavation is now taking place with completion of the mixed use development schedule for the first half of 2018. The DA number for this development is A004259720. “The Calile” – Congratulations to the Team, and think the name of the new James Street Hotel Development is very fitting, in honour of Cal Malouf and family, for many great developments in Brisbane . From Ray Pini and Ian Downing and PDT Architects Team (Powell Dods & Thorpe).